a promotional video for the anime on Wednesday. The video reveals and previews the anime’s opening theme song “Tenge Zekkei” by Daiki Yamashita , Katsuyuki Konishi , Kousuke Toriumi , Natsuki Hanae , Toshiyuki Morikawa , and Yuichiro Umehara as their characters. 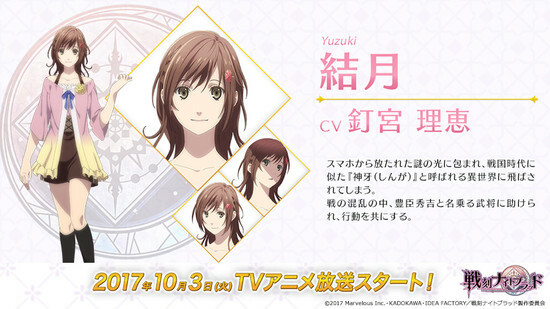 The site also revealed on Tuesday that Rie Kugimiya will voice the anime’s heroine Yuzuki. The anime will premiere on October 3 on Tokyo MX , Sun TV , TV Aichi , and BS11 . in Japan on May 30. The game centers around different warlords from Japan’s Warring States (Sengoku) period, who are all involved with the player character. The game is described as a “Warring States romance fantasy.” Each of the six factions in the game feature a different Otomate artist. Original character designers for the game include Usaba Kagero ( Wand of Fortune ) for the Oda Army, Mai Hanamura ( Amnesia ) for the Toyotomi Army, Shikisakigumi ( Hakuōki ) for the Uesugi Army, miko ( Code:Realize ) for the Takeda Army, Kuroyuki ( Period:Cube ) for the Sanada Army, and Teita ( Norn9 ) for the Date Army.